wealth that they want, and spices. Rates and spices is very expensive in Europe. Even as gold prices. These spices is useful for medicines and food ingredients. These spices can make the body warm. European Nations brought special mission. That is, spreading Christianity. That task is a very noble. They introduced the local people to Christianity. The first time will be done by portuguese. In Europe, people believed that if the country has many tributary, the country was a success. Then, the state of Europe race to find subject land. Movement Renaissance changed Europe. Science is ahead for example, the theory heliocentric by Copernicus with. He said, the Sun is the center of hosts. The planet it spins around the sun and it spins on its axis. man trying to prove this theory. Technical weather developing countries to sail through pacific that area. Weapons Technology is also there. Weapons function to protect weather from the threat pirate. Kompas has also there. Kompas function as directional signal. Previously, they modeled on stars in the sky. If no cloud over it, shipping them to be disturbed. In the middle ages, constantinople led by sultanate of Turkey. They forbid street vendors Europe to trade in constantinople. In fact, Constantinople was trading center european nations. Therefore, the europeans find other ways to work their needs. They were looking for spices to India, Asia. 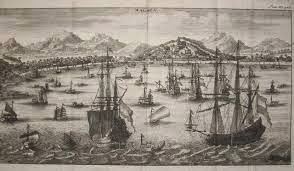 Based on the agreement Thordesillas, Spanish and portuguese start voyage to India. Spain sail to the west, while portuguese sailing to the east. Portuguese are first nation to come to Indonesia. In 1512 by, Alfonso De Albuquerque and the group ships come into Maluku. The Spanish into Indonesia in 1521 in Tidore (Maluku). Portuguese and Spanish make a new covenant, namely Saragosa. Based on the agreement, Spain had to leave Maluku and toward the Philippines. Portuguese is still in maluku for trade and spices. 0 Response to "The arrival of European people to Indonesia"